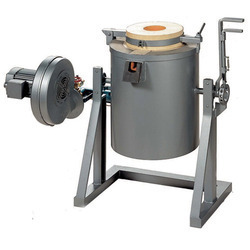 Pioneers in the industry, we offer tilting furnace from India. Being the market leader in this domain, we are actively committed towards offering excellent quality Tilting Furnace. The offered tilting furnaces are manufactured by skilled professionals, using optimum quality raw material and latest technology in accordance with the set standards at our end. Along with that, offered tilting furnaces are used by secondary recyclers for melting dross and low-grade scrap. We are giving these tilting furnaces to our customers at market rates.